Take your seats and let the show begin as the curtain rises at one of Devon’s favourite community theatres. 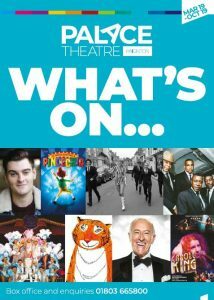 With performances and events running 50 weeks of the year you will be sure to find something to suit your tastes, from popular dramas to top-name entertainers and of course a very popular Panto season – oh yes there is! Benefiting from a major refurbishment in 2006, the 368 seats provide not just comfort but excellent viewing from all areas. You can select and book your seats online 24/7 and enjoy pre-show and interval drinks in the bar. The Palace Theatre is in the heart of Torbay, just a 2-minute walk from Paignton town centre and with free roadside evening parking. Bravo! Encore! You’ll want to keep coming back for more. 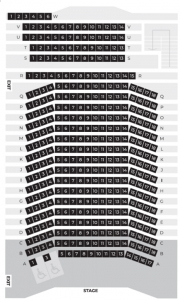 Tickets for the Palace Theatre can be purchased in person from the Palace Theatre, or by phoning the Box office on 01803 665800, or on line – just click the links by the show you’d like to book. Click the image to browse online. + Better Box Office facilities. Paignton Pantomime Productions is proud of its history and of all those dedicated people who, throughout its eighty years existence, have worked so hard to present a pantomime to the residents of Paignton and South Devon each Christmas. In March of 2018 “Cinderella” was awarded the June Barker Memorial Cup for the “Best Pantomime” production in the South West for 2017. This is the second time PPP has won this category in the last 4 years, its production of “Aladdin” having received the same accolade in 2014. The Society would be indebted to any current or former members of PPP or readers of this site if they would contact us with any information, pictures or programmes of past pantomimes. Bijou Theatre Productions produce four productions per year and has Theatre Club with an audience membership. You do not have to join to act, but you can join to watch. Their membership entitles you to see all of the annual plays (except the Agatha Christie). The aim is to promote good quality drama and provide community theatre. They also run an annual season of Agatha Christie featuring one of her plays every year. Productions featured include A Murder is Announced (2018), And Then There Were None (2017), Murder on the Nile(2016), The Hollow (2015), The Unexpected Guest (2014) and Spider’s Web (2013). Agatha Christie is perhaps Torbay and Torquay’s most famous resident and in her later years she lived in nearby Greenway on the banks of the River Dart. This is a weekly musical workshop group for people of all ages 14 upward, for all instruments and abilities. The workshop focuses on learning and playing traditional tunes from South West England and beyond, learning primarily by ear, although scores are provided as well. Doorstep Arts works in residence at the Palace Theatre, providing weekly drama classes for children and young people aged 4-25. They run 12 weekly groups – both six drop-in groups located at key doorstep sites across Torbay as well as six ‘Doorstep Arts Studio Courses’ based at the Arena in the Palace Theatre. They also run the Doorstep Theatre festival in April and October each year. A full timetable of weekly classes and more information can be found on their website. ROC Creative Torbay is one of the south west’s leading arts projects. Specialist practitioners with a wide range of arts interests and professional experience work with individuals who keep production journals recording their creative journey. ROC Creative, part of United Response, provides a learning environment to express yourself artistically, whatever your abilities or disabilities. Details here.